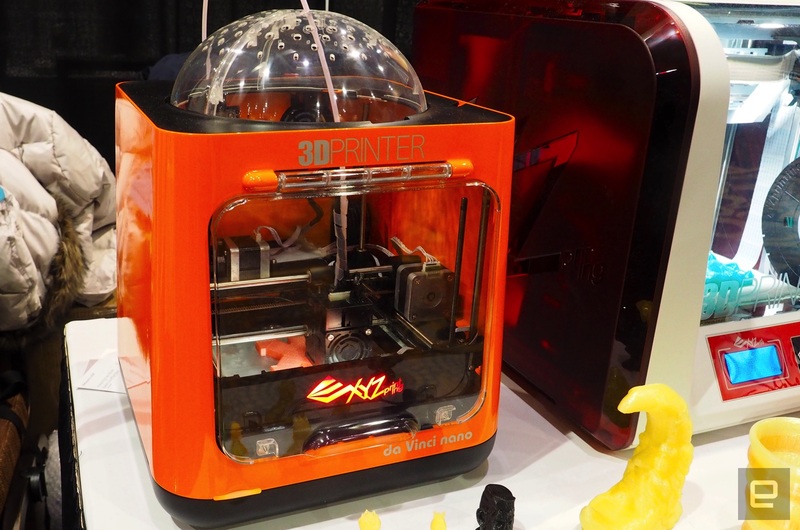 XYZprinting's new machine is an affordable gateway into the technology. XYZprinting is known for offering a variety of 3D printers, some of which rival the likes of Makerbot's Replicator line and other high-end hardware. But the company has also been making some that are both portable and affordable, as was the case with its sub-$300 da Vinci Mini. At CES 2017, it is going one step further by introducing the da Vinci Nano, a full-fledged 3D printer priced at just $230. And although the machine is designed for people who are new to the technology, XYZprinting says the idea is to not compromise on the features and overall quality of the product. Because the da Vinci Nano is being pitched as a plug-and-play 3D printer, Windows 10 PC users won't have to worry about installing any drivers to get it up and running. XYZprinting also made things easier by adding auto-calibration and auto-leveling, which should simplify dealing with the PLA filaments. Unfortunately, the da Vinci Mini Nano won't be available until later this year, but it's worth keeping in mind, in case you've been looking for a 3D printer that won't empty your wallet.